A letter asking for a receipt to attend the wedding is the all about wedding invitations. 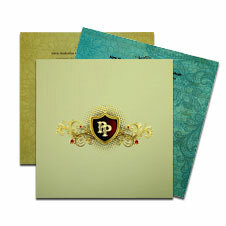 Providing you more than 500+ fonts, 123weddingcards.com has got everything you are dreaming of for your big day. To enhance your big day, we have got a great number of modern Hindu wedding cards that are sure to bring zeal and provide your personal touch. 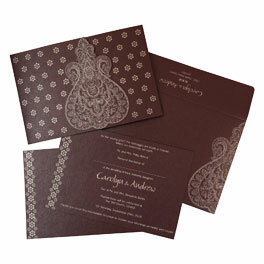 From a huge collection of floral invites, peacock invites, laser cut invitations, hot foil sampling invites, and a lot more, we also provide personalized monograms, motifs, soothing prints, mesmerizing patterns which are sure to allure you. Well connected with vendors and running successfully in the USA, we leave no stone upturned in making your day a memorable one. Can I purchase the card without printing? Yes, you can purchase the cards without printing by directly ordering from the website or by mailing your request. How much time do you take for the whole procedure? Well, as soon you finalize the sample, the proof design starts. And soon when the proofs are finalized, and payment is thru, the printing jobs takes the front seat. Intimating you prior three-to-four days of delivery. The final cards to reach your destination it takes nearly 10-15 days for the complete procedure. Do you provide an extra page or inserts extra cards on the inside? Yes, you can add extra pages with your card if the text is more on the card. But there will be extra charges for printing and insert added to the final cost. You are always free to inform us about your requirement or mail us the details. Worked with more than 20,000 customers, we 123WeddingCards would be glad to serve best online wedding invitations at best price. Experiencing difficulty while ordering at 123WeddingCards? No stresses folks!! Just visit our How to Order Online page where we have mentioned a complete easy procedure to make your order without any worry. With exclusive designs of marriage cards , we have successfully launched our exclusive collection of wedding cards India for the folks who are becoming two to one all over the world.